To begin describing Citadel services, it is worth mentioning that there is a significant difference between Citadel Commerce and My Citadel. As latter provides a great variety of depositing options and Citadel Commerce is the online check service dealing only with e-checks. What about My Citadel? 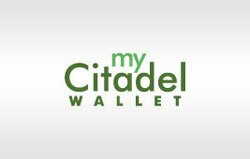 My Citadel is a very popular and reliable e-wallet, allowing funding almost all online accounts, making purchasing and online payments. It is one of the most secure and quick online mode of money transferring. My Citadel online money account offers multi-language and multi-currency customer services alongside with an amazing customer support service (e.g. e-mail, chat and phone support) operating 24/7 all year round. My Citadel online account is very easy and secure way of money transferring and it can be funded in different ways by means of credit cards (Visa or MasterCard), electronic transfer, personal bank account or bank transfers. My Citadel created the user-friendly environment offering its services in different languages and currencies. Despite a big number of advantages, there are some weak points in this online payment mode. My Citadel account service is not available for the US as well as for the Canadian citizens. My Citadel is a popular online payment mode and electronic account, but the fast-growing online gaming business, it has become one of the payment method in many online casinos. A lot of gamblers are choosing My Citadel as their depositing option while playing due to its easiness quickness and safety. My Citadel provides its users with high quality security systems and the latest encryption software technologies. Gamblers can easily make deposits in casinos accepting Citadel, poker rooms & sports book accounts via their Citadel account. As many other companies providing online payment services, Citadel company has set some limits on depositing and withdrawing. For example, My Citadel account has a 2500â‚¬ deposit limit, unless an user verify his/her identity to increase the limit. Withdrawals have no limits when using bank transfers or direct bank deposit, but there is a charge for withdrawing by means of paper checks. 7â‚¬ will be charged for 1st class mail check delivery and 57â‚¬ - for Federal Express Courier delivery service.